Our Bollywood beauties have an electrifying presence at the “Cannes Film Festival” and this year was no different. 3 of our very own divas, Aishwarya Rai, Katrina Kaif & Sonam Kapoor represented L’Oreal at Cannes. Aishwarya Rai Bachchan is known as the Empress of the red carpet event at Cannes and she totally lived up to the moniker this year as well. It’s amazing how she never fails to galvanize her fans. The former Miss World looked phenomenal in her Elie Saab gown. The green colour added to the glow on her face. She decided not to keep her look too bold this time & carried herself with grace. And she looked awe inspiring in this Oscar de la Renta maroon off shoulder gown. She looked superlative in this Ralph and Russo architectural folds gown. I had a “jaw-dropped to the ground” moment when I saw her in this exquisite ensemble. Katrina Kaif likes sporting comfy clothes and so she kept it quite simple and picked a black & grey Oscar de la Renta gown to begin with. But what left her fans open mouthed was her second look in an Elie Saab red gown with minimal make up coats on her skin. She totally nailed this look. Needless to say, the style icon -Sonam Kapoor has set our expectations quite high with her previous Cannes sightings. She is over-scrutinized and even a simple miss is not pardoned easily. However, we are happy to report, she had more hits than misses this year at Cannes and that is why we at CB are willing to overlook her mistakes (rather unwillingly!). Sonam made all the heads turn while she walked down the Red Carpet in her Ralph & Russo Couture blue gown. Like any other woman, diamonds are her favourite & she flaunted her love for them on the red carpet too. She teamed up her designer gown with diamond danglers by Chopard. And what makes her look the best is her beautiful smile which she wore throughout. 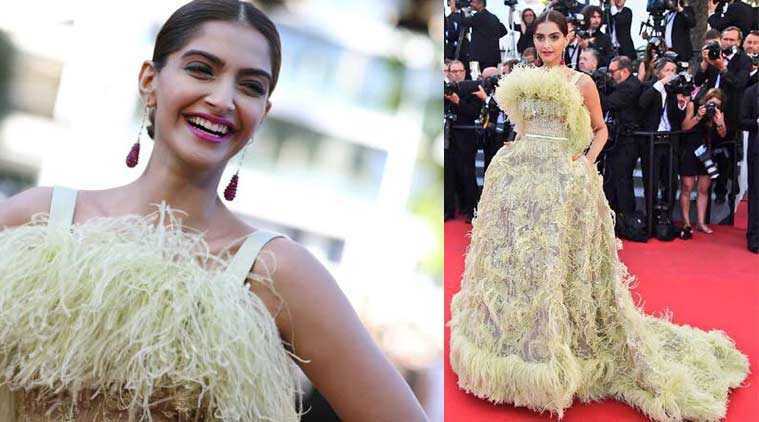 With a series of jokes doing rounds on the internet, we agree this one was a big mistake, What we liked however, is the confidence she carried the Elie Saab sorbet feathered dress with. Full marks for that! The final appearance of the Bollywood prima donna was even more radiant. She dazzled in an Abu Jani Sandeep Khosla black & gold gown at the Chopard party. This wasn’t a red carpet appearance but it deserves a mention nevertheless. Sonam wore an appealling saree which was Oh! so daring by Abu Jani Sandeep Khosla at a press conference. This one has our heart!